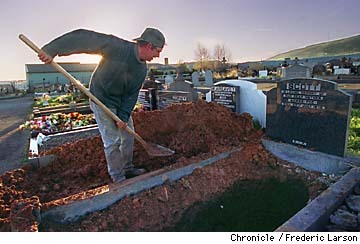 This Irish gravedigger from Belfast mirrors Yeats's gravedigger from Under Ben Bulben. The gravedigger compliments the theme of Immortality, as Yeats says, "The but thrust their buried men/Back in the human mind again." He does not bury the legacy of the great Irish artists. This is a ritual of instilling the triumphs of these great men into the minds of the people.